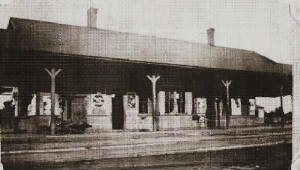 [5.1] The Extension opened for service late in 1888. This westward linkage of the NH&D in corporate form dated back to October 21, 1882 when articles of association for the Housatonic Valley RR were filed with the Connecticut secretary of the state. This project was backed by the New York and New England RR, which purchased it and gave it to the HRR to build [CRC36.1888.5]. The HRR was limited by its charter to branches of less than 10 miles, so it was to construct only 9.79 miles down from Botsford to meet its leased NH&D which was building the rest, some 3.79 miles up from Hog Island, just across the Naugatuck River from Derby Jct. The purpose of this branch was to enable the NY&NE, and the HRR it controlled at the time, to enter New Haven to better compete with the NYNH&H. The layout of the Extension was approved by the railroad commissioners on February 6, 1888 [CRC36.1888.14]. 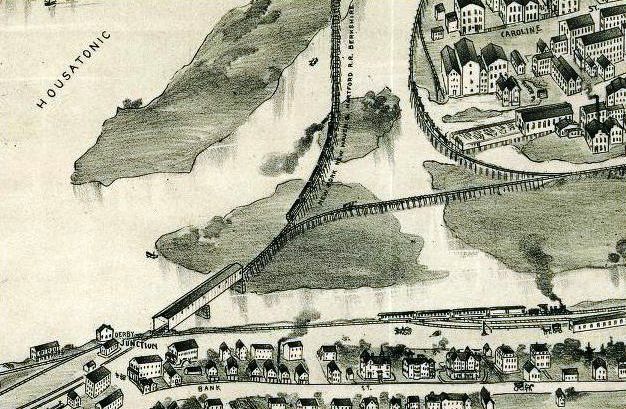 It was three-quarters graded, the first mile of track south of Botsford was in place, and two-thirds of the pilings for the trestle crossing of the Housatonic River were done by July of 1888 [NHER/07/06/1888/01], with estimates of 800 to 1,000 men or more on the job. This was difficult work once the line left the river, with mountainous terrain to conquer, surprisingly just 20 miles from New Haven. Considerable trestlework, expecially near Zoar Bridge, was necessary. The work was made somewhat easier when the railroad engineers found "the remains of the military road made for the transportation of the French artillery" in Rochambeau's Revolutionary War march to New York in 1781 [Sher, p12; click here also and see p36]. Public excitement over this ambitious project led to a spirited real estate auction held in Birmingham where 2,000 people bid on lots expected to increase in value with the coming of the Extension [NHER/05/23/1888/02]. In fact the NH&D completed about 7.5 miles of track to their station 402 above the Round Hill trestle, stopping on October 4 with the HRR crew 1500 feet away [HC/10/08/1888/06]. 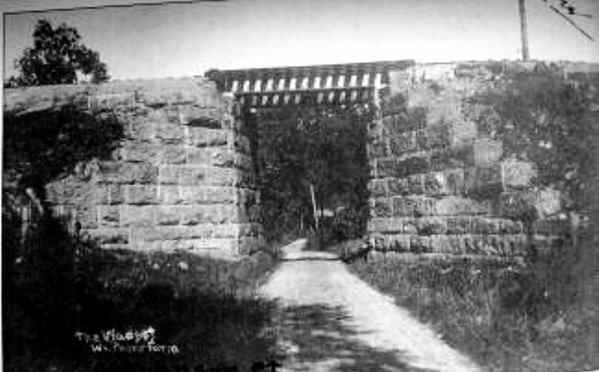 A gala gold- and silver-spike ceremony on October 17, 1888 marked the completion about a mile below Zoar Bridge [See Track 6, MP 6.5.2 for more]. The opening was the fulfillment of the NH&D's promise from the start to be the 'Gateway to the West' for New Haven, a compass direction that its other railroads never adequately addressed. This was not only a banner day for the Elm City, but also for the town of Huntington's Shelton borough, booming with industry and in need of direct rail service. The commissioners certified the line as safe for public use on November 14, 1888 [CRC36.1888.14]. 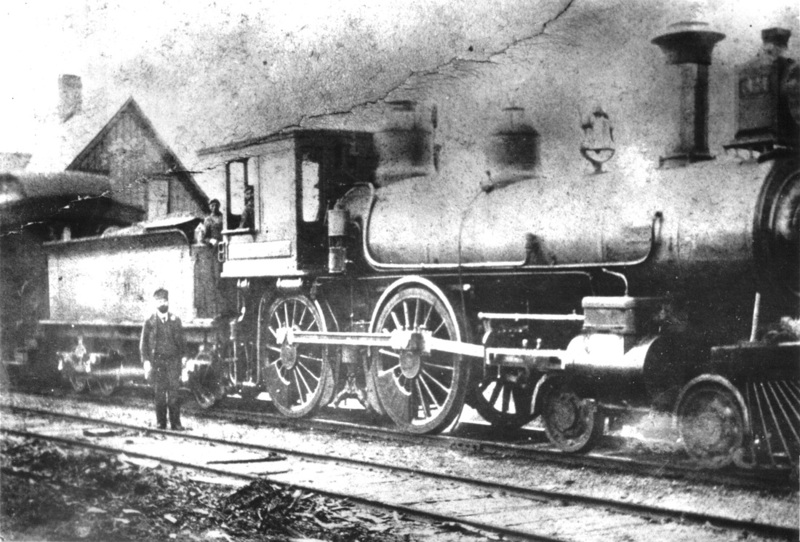 The first regular train on the Extension ran on November 26, 1888, some 20 minutes late because of storms and track damage the previous evening. About 20 people rode in a consist of four cars, three passenger and one baggage and, in spite of the lingering bad weather, onlookers came out to cheer the maiden run [NHER/11/26/1888/03]. A Register article [NHER/10/16/1888/01], which appears to be a reporter's account before the official opening, provides much of the detail below. [5.2] Our reporter says the Extension started "a few feet from the junction of the Naugatuck and Derby railroads" at Derby Jct. (lower left) and ran 2,000 feet before diverging on Hog Island toward Shelton via (O')Sullivan's Island. The next 2800 feet was first said to be all 'spile' trestlework and was dubbed the 'Starbuck piling' for the HRR president. The implication of an extra track right from Derby Jct. has to be discounted because the 1880 covered bridge was built only for a single track and this bridge was not replaced until 1904 by a triple-span built by the Consolidated. The Housatonic islands still seen here would be connected later to the Derby mainland by natural silting and the deliberate filling in of the flats. 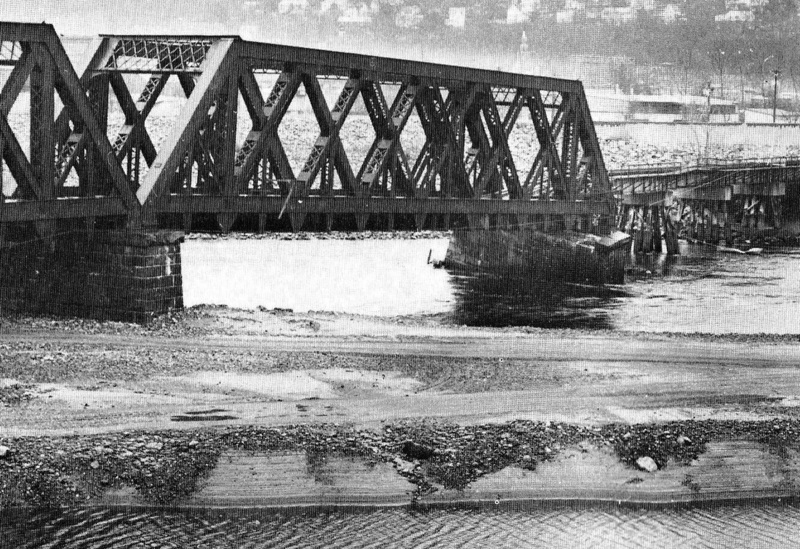 [5.2.1] Captured here in this priceless photograph is the replacement of some of the trestlework with the first iron span over the Housatonic River going into Shelton, which is to the left. 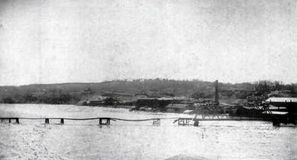 Our reporter says that work on the coffer dam for the first pier for the iron bridge was in progress in October, 1888 even before the opening of the Extension and that it would take a year to complete all the work. 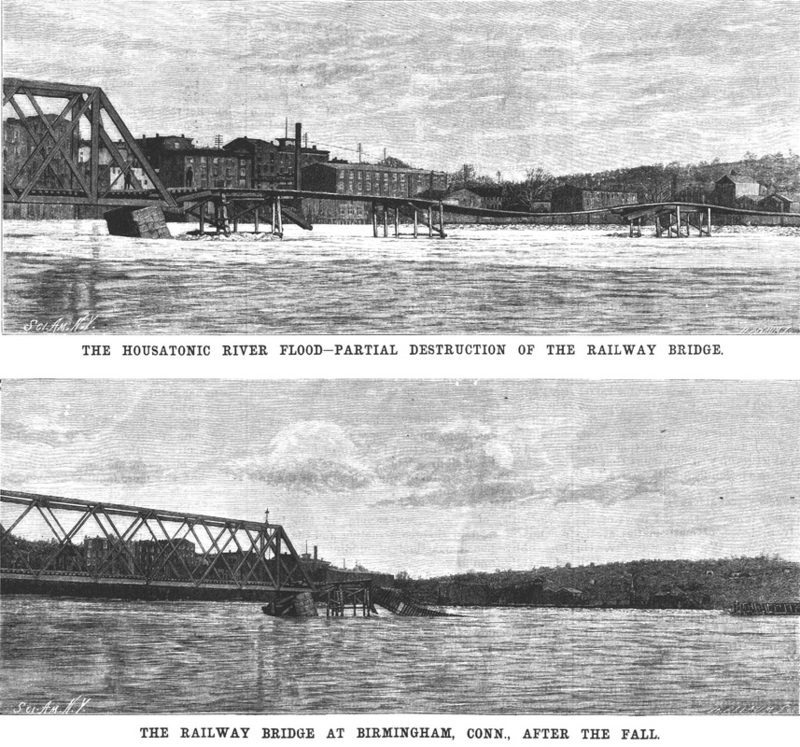 The erection of the bridge appears to have taken place in 1890, when a newspaper article said that the new iron bridge was being installed. It was described as a steel-riveted, lattice span, 156 feet in length, 28 feet in height, 16 feet in width, and 14 feet in clearance over the river, needing 5,000 rivets to assemble it [HC/05/27/1890/06]. The completion was mentioned at the end of 1890 in the HRR annual report for that year [p4]. This photo appears in the Images of Shelton book [p41] with a date of 1888, which appears to be in error. The second span promised by Pres. Starbuck, for less obstruction to navigation and more protection from ice damage in the winter, was not put in at this time. [5.3] The price of delaying the second span was perhaps paid when the most serious winter freshets in a generation started the Housatonic River rising from January 11 to 28, 1891, and on the latter date it breached the Ousatonic Water Co. dam. This sent chunks of ice downstream, mounting to 12 feet in spots, devastating the frail railroad line across the river [CRC39.1891.14; NHER/07/18/1888/01, 02/24/1890/02, 01/17/1891/01, 1/23/1891/01]. The damage is seen in these three images. If you look closely at the single photo, you can see the single iron span on the right, which is the Shelton side. The paired images are engravings that appeared in Scientific American [03/21/1891/183]. They were made from photographs that were reportedly taken within a few hours of the destruction. The view in these images is looking toward Birmingham where the easterly stone pier has sunk noticeably, it being the one closest to the middle of the river. The one in the similar position would give out again in 1983. 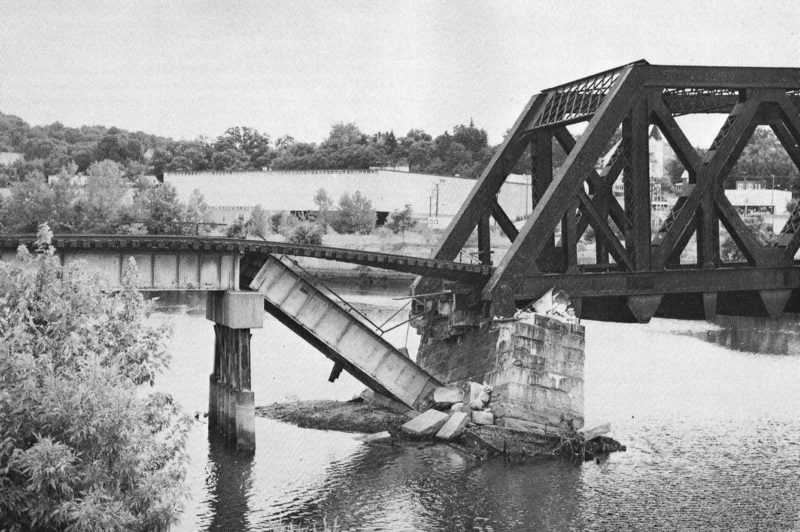 It was estimated that this damage would cost the railroad $50,000, plus the loss of business, though elsewhere we have read that merchandise was to be carted across the Huntington bridge between Birmingham and Shelton to keep the freight moving. Passengers could board and disembark at those stations as well. 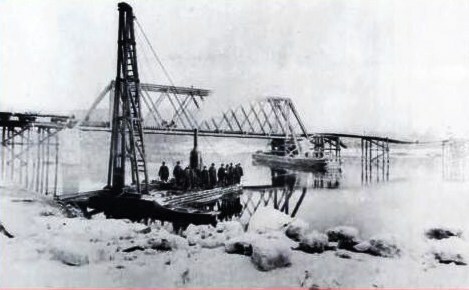 [5.3.1] The second span was not put in until the Consolidated did it late in 1892. It was duly noted by the railroad commissioners in the first of their twice-annual inspections in 1893 [NHER/10/15/1892/01; NHER/06/10/1893/03]. 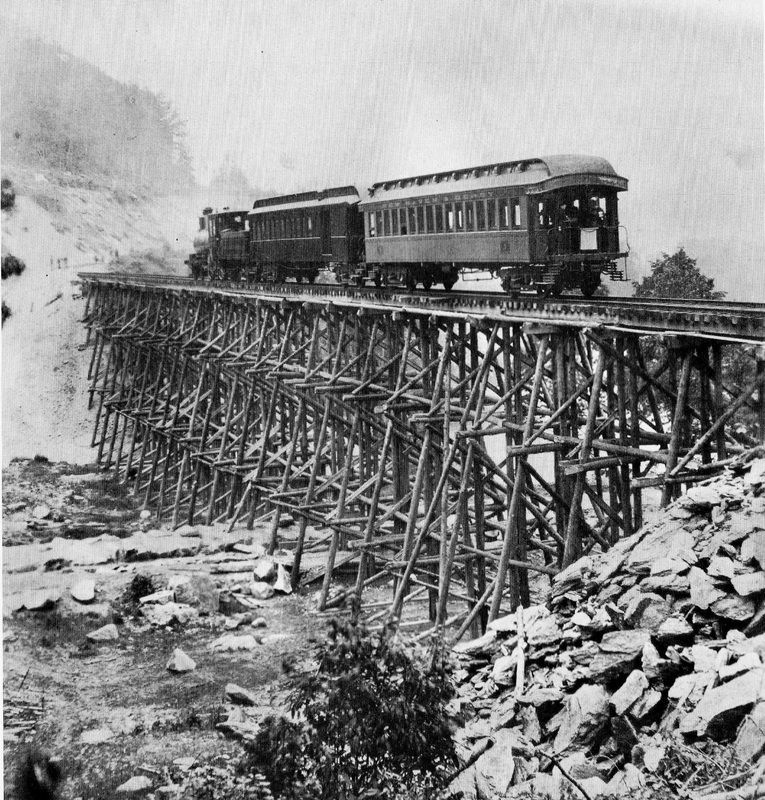 That would date the postcard view above to sometime between late 1892 and 1905 when work started on the replacement of this bridge with the double-tracked span. Visible in the distance over the trestlework on the left may be the covered bridge from Derby Jct. to Birmingham, which would not be replaced until 1904. [5.3.2] This shot is from a 1919 aerial view of Shelton. Click herefor the entire Hughes and Bailey map. 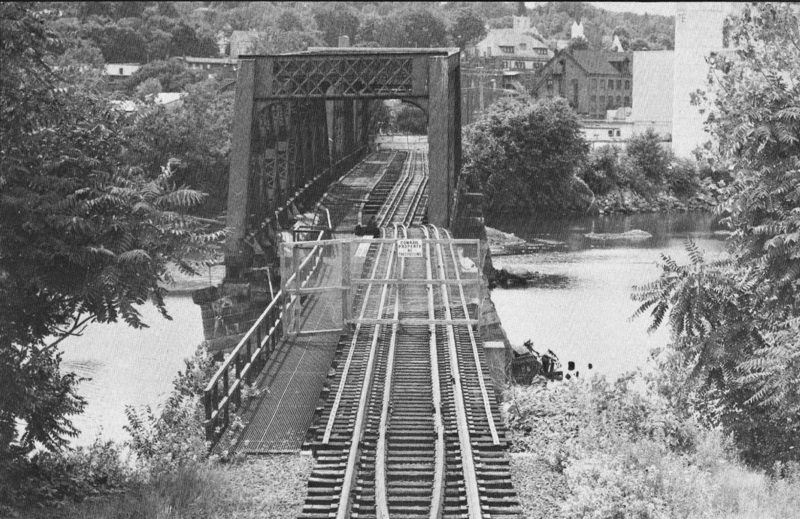 The blue arrow points to the now three-span, double-tracked bridge over the Housatonic River that the NYNH&H installed. Plans were first mentioned in the newspaper in August, 1904. The article said it was to be 450 feet in length, comprised of three 150-ft spans. Within the width, the two tracks were to be laid on 13-ft centers, in anticipation of larger freight car dimensions. The railroad had reportedly adopted this new standard in April of 1903 [ES/08/24/1904/07]. Construction of the new bridge was under way in 1905 [CRC53.1905.26] and it was finished by June of the next year [NHAR35.1906.5; CRC54.1906.241]. It is unclear whether the old piers were broadened or completely new ones built for the wider bridge. 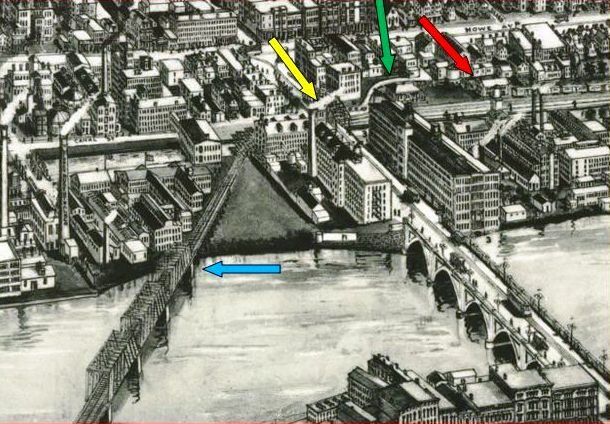 The yellow arrow points to the Bridge St. viaduct over the railroad with the new concrete arch bridge to Derby, built in 1918, at the lower right. The green arrow points to the passenger station and the red arrow points to the freight station. 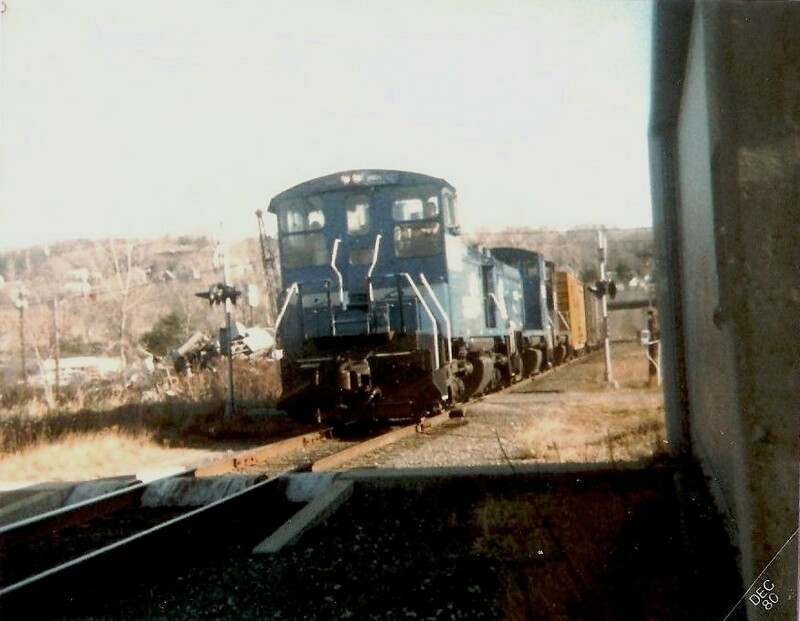 [5.3.3] These two photos are from 1980 when we were chasing a Conrail freight working in this area and presumably heading for Danbury on the Extension. 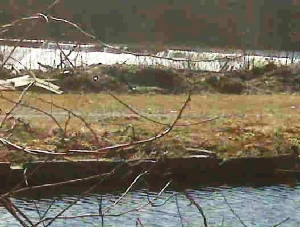 The location of the upper photo has been clarified by a TCS visitor as being at the floodgate, seen on the right ahead of the engine, on the eastern bank of the Housatonic River, with the raised barrier to form the seal visible on the ground. The Route 8 overpass is in the background and, if this picture were taken today, the Derby Greenway would be overhead just at the point from which this picture was taken. In the lower shot, our consist is just beyond the floodgate and about to cross the river on the 1906 bridge. [5.4] The photo on the left is from 1980 and the other is from 2008. Two of the old stone piers, probably from 1905-1906, still support the bridge today. The one closest to Derby sank into the river in March of 1983 after heavy rains and was replaced with the concrete one seen here [ES/03/22/1983/01]. The double-tracking of the Berkshire division from Derby Jct. was approved by the directors late in 1909. Long passing sidings were already in place on the Extension as the last portion of the new double-tracked freight line to the west was about to be completed. As far away as Minnesota, the Duluth News-Tribune was reporting that the "rural wilderness" of Maybrook [N.Y.] was being developed into a "New Gateway to New England" to avoid the "choked knothole" of New York City. 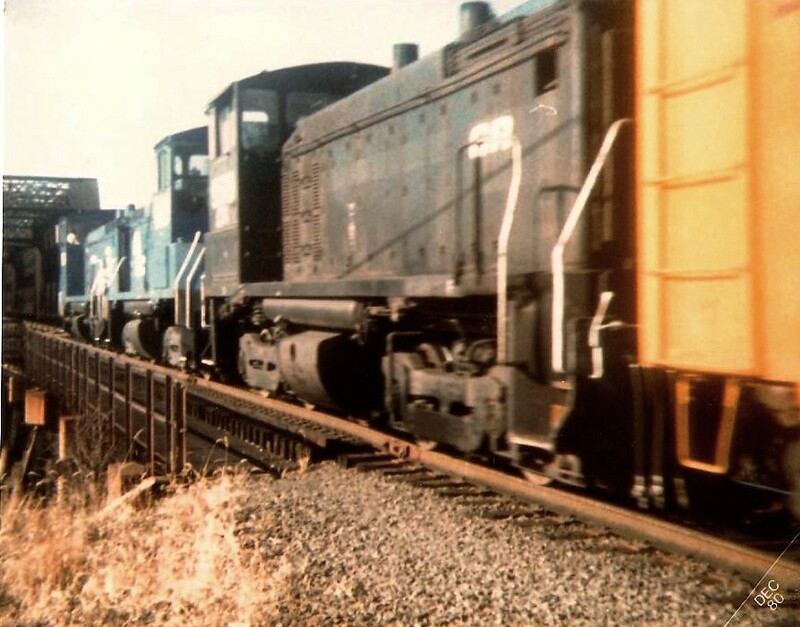 After a more than a half-century of service, the second track was reduced once again to passing sidings by 1961 [DLNH: 66] due to falling freight volumes, retrenchment, and bankruptcy. 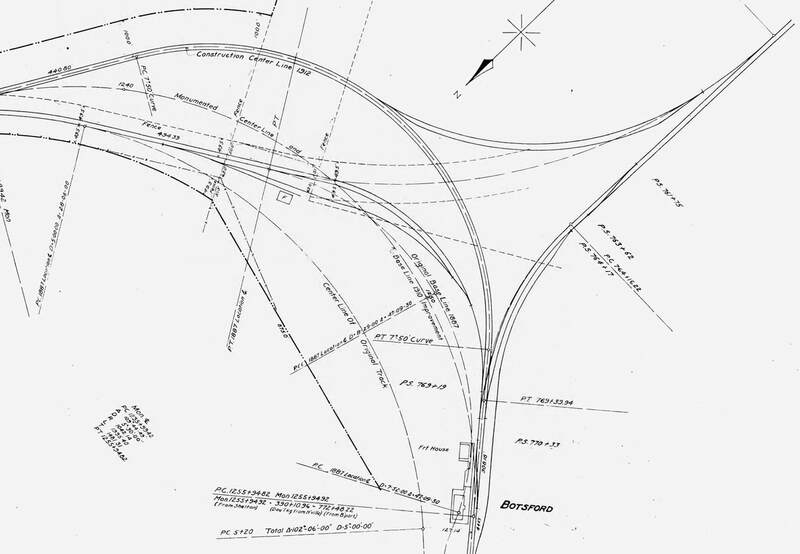 A newspaper article said in July of 1959 that the railroad had removed the second track from Poughkeepsie to Maybrook and put that section under centralized traffic control (CTC) that was to be governed from Danbury. Powered switches were set to have eastbound trains take the sidings with spring switches allowing them to regain the main along the 98-mile route. The Derby to Danbury portion was to be finished by the end of 1959 and the remainder to Poughkeepsie thereafter. It was expected to recoup "a large share" of the $920,000 cost from the sale of the scrap rail. Operating efficiencies and lower track-maintenance costs were also cited in favor of the plan. [5.4.1] These photos were taken by Jack Swanberg on July 23, 1983 after the bridge collapse mentioned above and we have reprinted them with his gracious permission. We did the best we could, scanning them at 300dpi from the Shoreliner [15.4.30+ (1984)]. They accompanied an article entitled "My Bridge," by Jim Minor, an NHRR operator and dispatcher. We found this and many other forgotten pieces in a recent revisiting of the 30 years of issues we have collected. 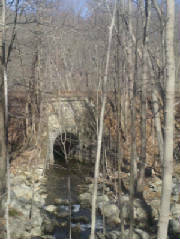 Jim's article was nicely written and enthusiastically recalled the glory days of 'his' bridge and the Maybrook line. We may not actually be able go back, but at least we can revisit those good old days in our Shoreliners! [5.5.1] This is a shot of the viaduct bridge over the Extension in Shelton. The view looks toward Birmingham and you can see the 1857 Huntington covered bridge over the Housatonic River in the lower right. The entire roadway from that bridge almost back to Howe Ave. was raised to provide enough clearance over the tracks. 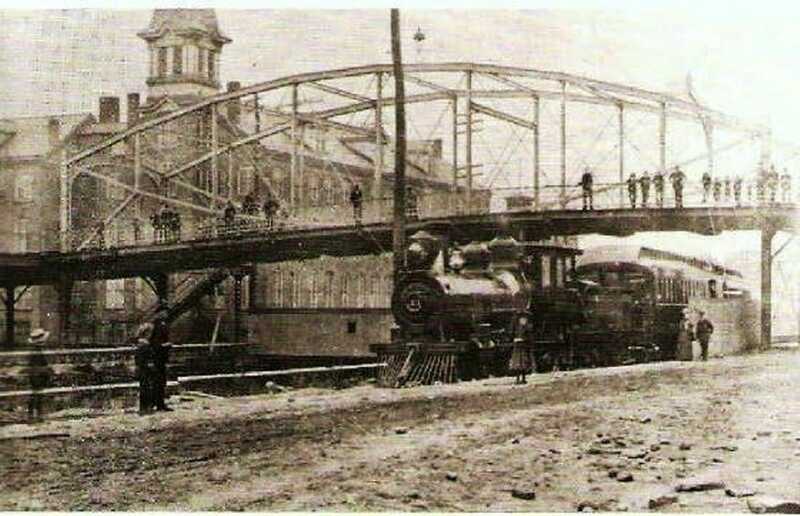 This photo dates to between early 1889, when the viaduct was probably finished, and 1891 when the covered bridge was replaced by an open, iron structure. This photo also appears in theImages of Shelton book on p. 41. The interesting type of bridge construction for the viaduct is called a parabolic or a lenticular truss, the latter for the lens-like curve of the top and bottom chords. 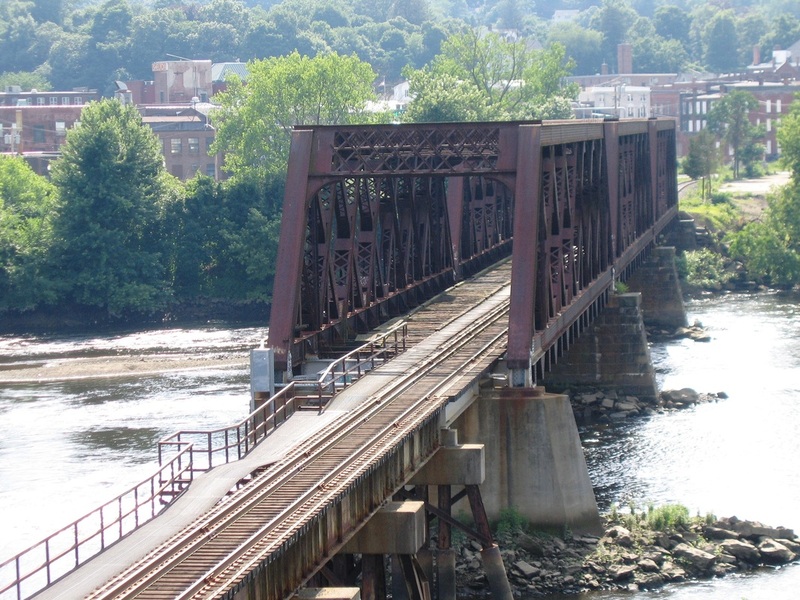 Connecticut's own Berlin Iron Bridge Co. patented a type of bridge like this, usually made of wrought iron, and likely built this one, though no direct attribution has been found yet. Click here and here. The viaduct figured in a later legal battle when, based on the fact that the HRR/NH&D installed it, the Consolidated claimed, futilely, that it was privately owned and that the Shelton Street Railway could not lay its track across it to get to Birmingham [NYT/05/05/1896/02]. Ironically, in light of the fears of 1888, this viaduct was said to have 'collapsed' in 1950 after a heavy cement truck passed over it. Shelton's Mayor Lemay sent a telegram to NYNH&H Pres. Dumaine demanding that the "antiquated" viaduct be replaced immediately [NYT/10/25/1950/10]. Apparently the old viaduct was not so seriously damaged that it couldn't be repaired. It was not replaced until 1973 with the present Veteran's Memorial Bridge. 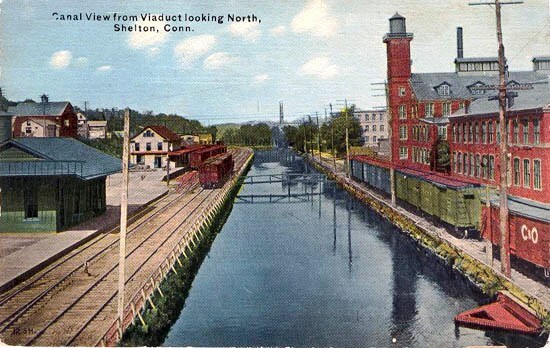 [5.6] This postcard view shows the Shelton passenger station to the left with the two-story freight station farther down the track. 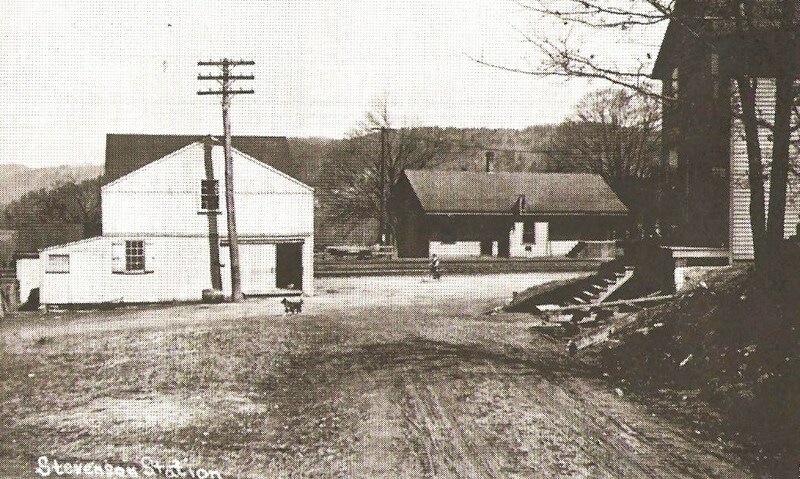 Note the tracks on the north side of the Ousatonic Water Co. This siding was probably the one "along and across Canal St." that was requested for switching purposes by the water company, which owned most of the land along the canal, in a hearing on April 10, 1906. It was approved by the railroad commissioners on April 26 [CRC (1906) 54: 8]. 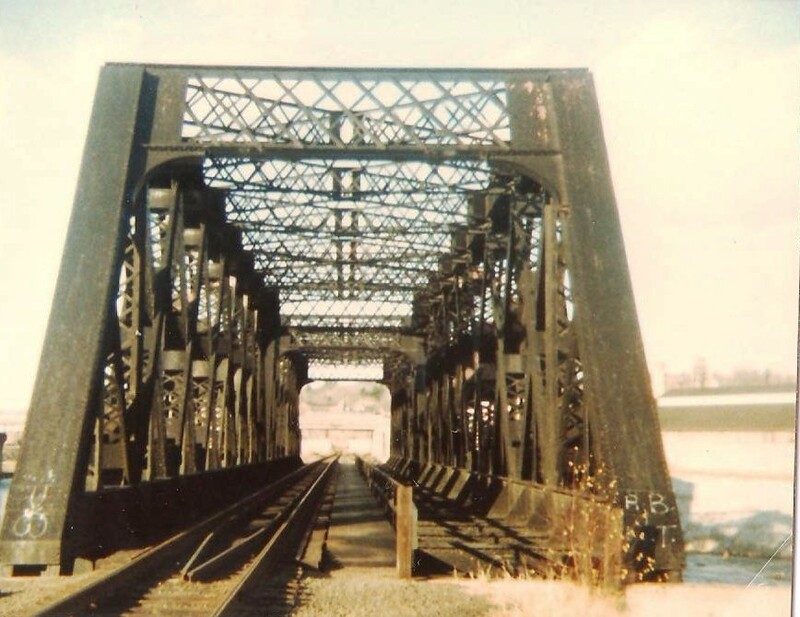 The siding ran from a connection above the freight depot at Brook St. all the way down to end at Wharf St. beyond the railroad bridge from Birmingham. The canal was fed by the company's upstream dam, which was built in 1870. 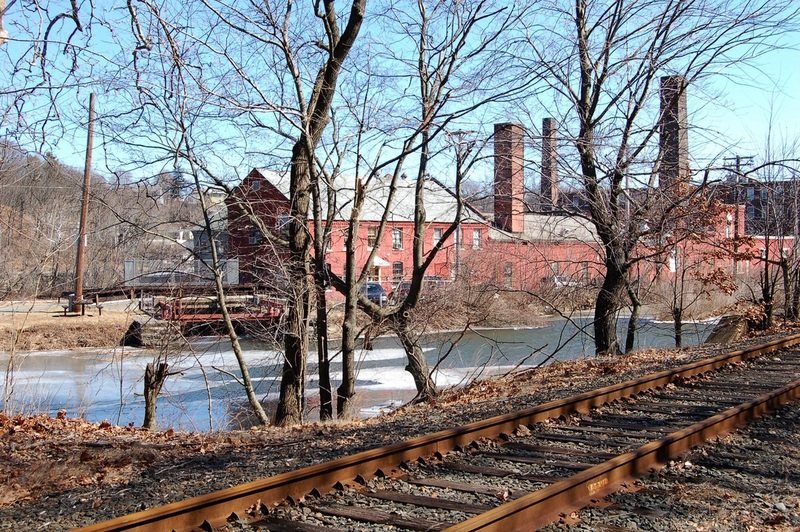 With the harnessing of this water power, industry in Shelton boomed and resulted in the changing of the name of the entire town from Huntington to Shelton in 1919 to reflect the importance of the central borough. [5.7] Shelton station. The photo on the left appeared in the Illustrated Review of the Naugatuck Valley [p41]. The 1891 publication date is interesting because the picture is captioned as being the design of the proposed the depot at Shelton. 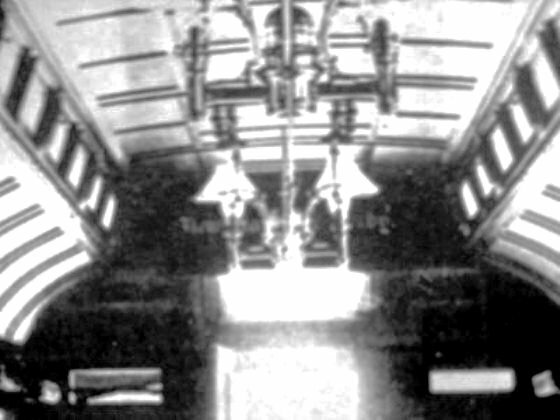 Not a whole lot of detail can be seen but the finials, the twin chimneys, and the gingerbread trim that is faintly discernible seem to resemble HRR wooden structures of the period like DANBURY4 and NEW MILFORD2 [see D, N stations]. As fate would have it, this depot would never be built because by July of 1892 the NYNH&H would lease the HRR/NH&D and build a brick depot in its own style here, costing about $5,000. Newspaper articles reveal that the basement room in an adjacent house that had been used as a station since 1888 was abandoned in October of 1892 with the opening of the structure seen on the right [NHER/08/16/1889/03; NHER/10/15/1892/01]. That photo was taken on September 24, 1930. Passenger service had already ended on the Extension by this time and the station in Derby was renamed Derby-Shelton to reflect the change. See S stations on Track 16 for additional views of SHELTON2. [5.8] This train is not the one seen above. This is a Sunday school picnic special at Shelton station. The freight house, with the ornate window in the gable is up where the engine has stopped. Perhaps this is the St. Mary's group from Derby that had a picnic excursion of some 13 carloads going to Parlor Rock, the HRR's popular park and grove in Trumbull, in August of 1889 [NHER/08/20/1889/03]. With the Extension and the wye at Botsford in place, this was now ever so much more accessible by rail from here. Click here for more on Parlor Rock and see also P stations on Track 16. [5.8.1] A ca. 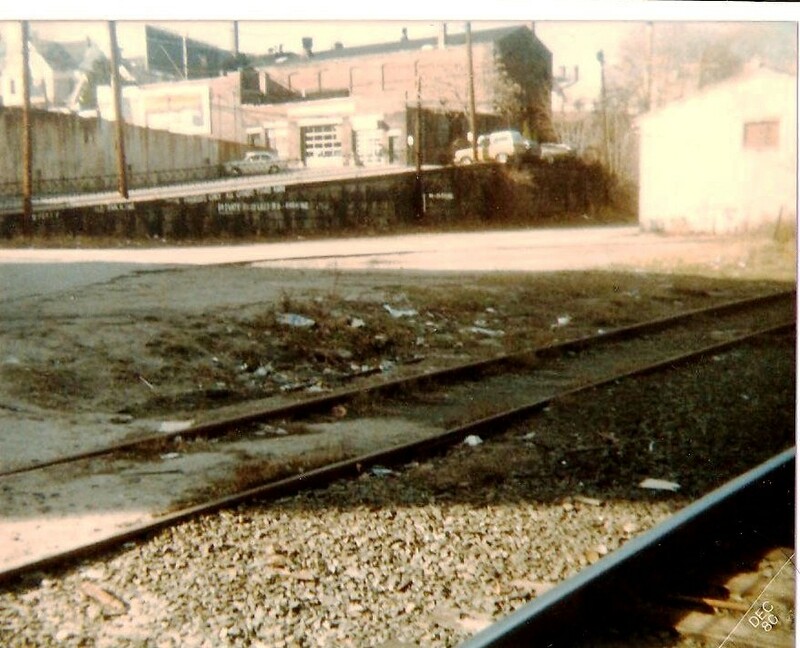 1980 shot of the vacant area where the Shelton station once stood. 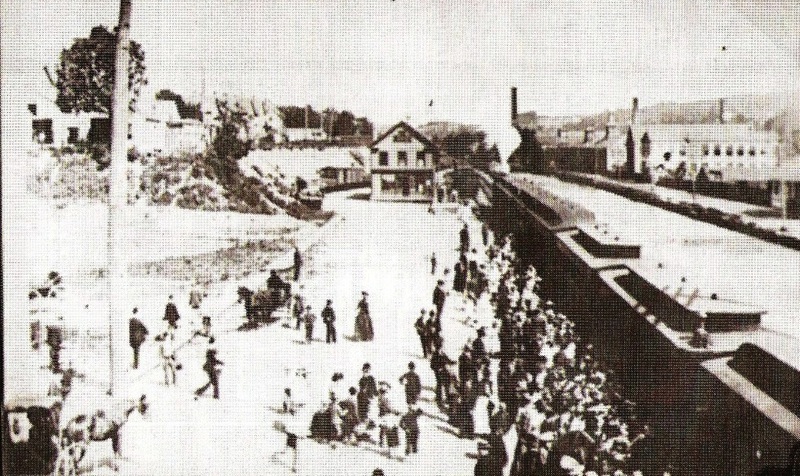 White St., which once served as the station approach, comes down the incline from Howe Avenue. [5.9] Jumping ahead a century, the Providence and Worcester RR is shown here operating to Danbury over the Extension in 2004. Here the P&W gravel train passes through Shelton. It appears to be just beyond the site of the old Shelton passenger and freight stations. Note the rails from an abandoned siding sticking out of the pavement on the lower right of the photo. [5.10] This is a 2007 view from just above the Shelton station location and just ahead of the P&W consist in the picture above. The shot looks across the old canal toward some of the vestiges of the great age of manufacturing, now mostly gone. The canal itself has been the subject of some controversy recently due to land development plans. Click here for more information about the canal and the nearby area. 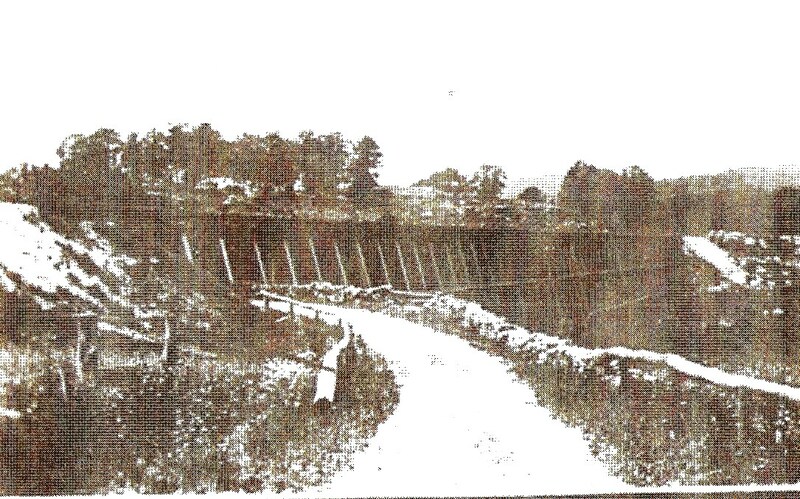 [5.10.1] The Ousatonic Dam and the canals on both sides of the river were finished on October 5, 1870 after three years of work. Locks on the Shelton canal allowed barge navigation around the dam and gatehouses on both sides of the dam controlled the respective water flows into the canals. An additional benefit from the dam was Lake Housatonic, which was formed behind it and offered all-season recreational opportunities on the river. Winter trotting races on the ice were sponsored by the Derby Driving Association, the same group that ran the racing park on the Naugatuck River flats between Birmingham and Ansonia, when water levels permitted [NHER/02/13/1884/01]. These two engravings are from the same issue of Scientific American [03/21/1891/182] as seen at MP 5.3.0. 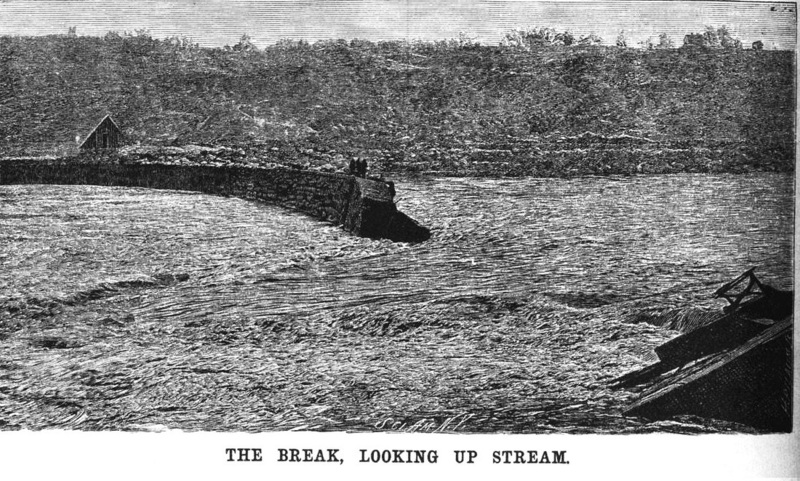 The lower one shows the break of January 28, 1891. Damaged was done to the gates and abutments on either end as well as 125 feet of the dam's 637-foot length. Click here for what seems to be another view of the damage, though the online caption says the photo dates to ca. 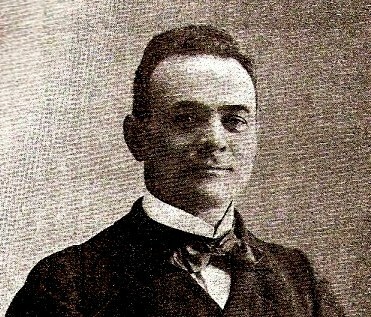 1894. 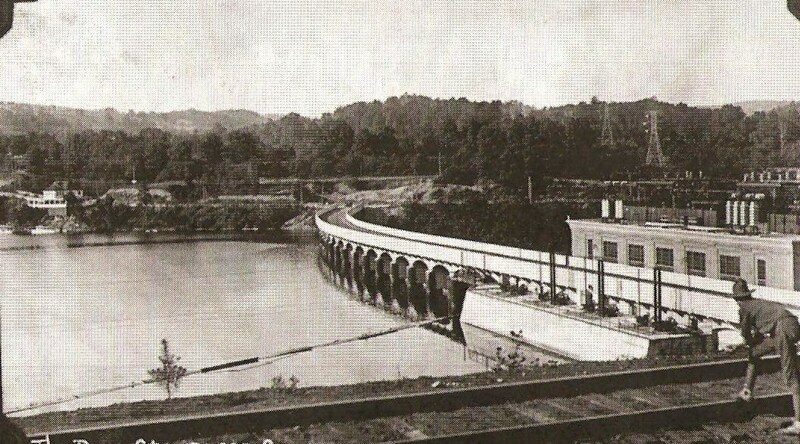 Work to rebuild the dam was begun in March and finished in late October of 1891. The new design used a sloping apron instead of the old straight-fall style that helped to undermine the foundation. [5.10.2] A current view of the Ousatonic Dam from the Derby side of the river. The gatehouse is still standing just out of sight to the right. The water in the foreground is the canal on the Derby side of the Housatonic River. While much shorter than its mile-long counterpart on the Shelton side, it did spawn some industry here as well. 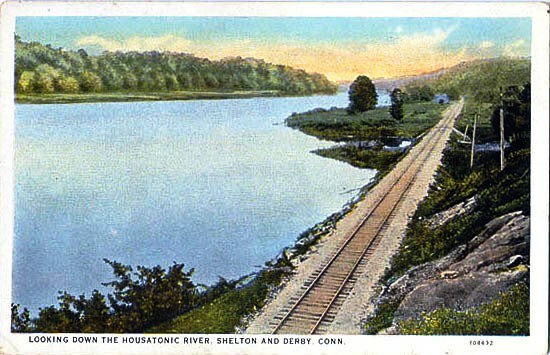 [5.11] Idyllic postcard view along the Housatonic River looking south toward Shelton. The culvert in the distance may well be where Indian Hill Creek empties into the river. The structure seen in the next photo does not appear here, but there seems to be the outline of a foundation just above the culvert and east of the track on the postcard. 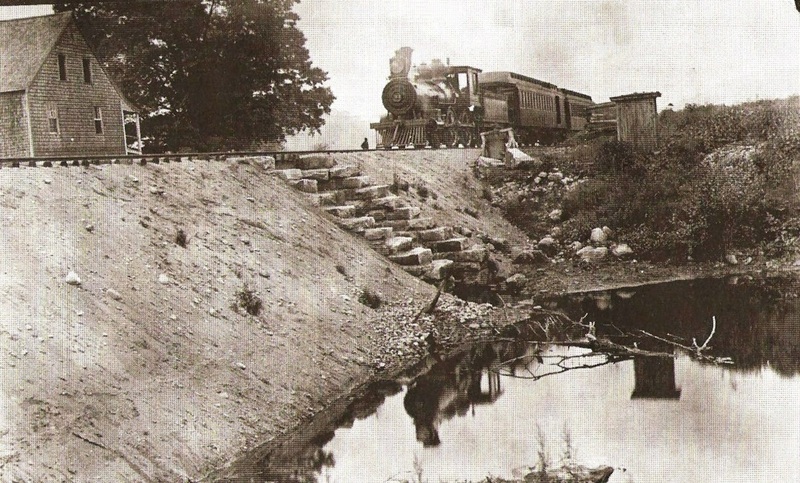 [5.12] This is a shot of the Indian Hill Creek culvert with our 1889 consist heading toward Botsford. That would identify the water in the picture on the engineer's left (west) as the creek. 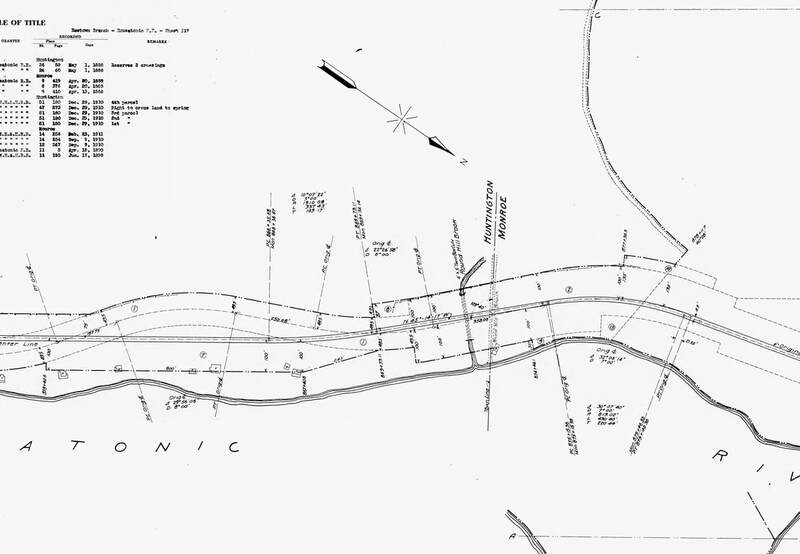 The article says: "Opposite the old Indian mill is a solid granite culvert in the embankment, through which a little stream flows into the Housatonic..." The river then is just out of sight on the engineer's right (east). 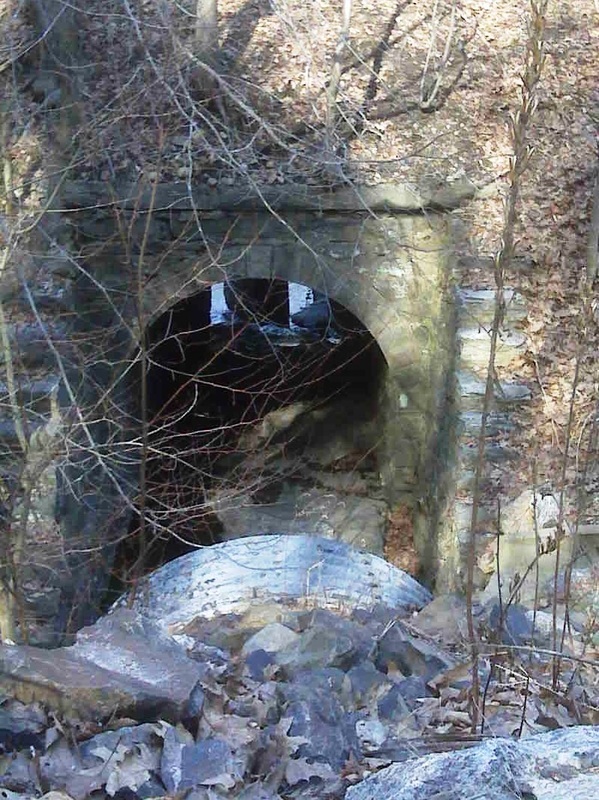 The structure must be the mill and the culvert probably of granite, as the reporter describes. Today's Indian Well State Park encompasses most of this area. 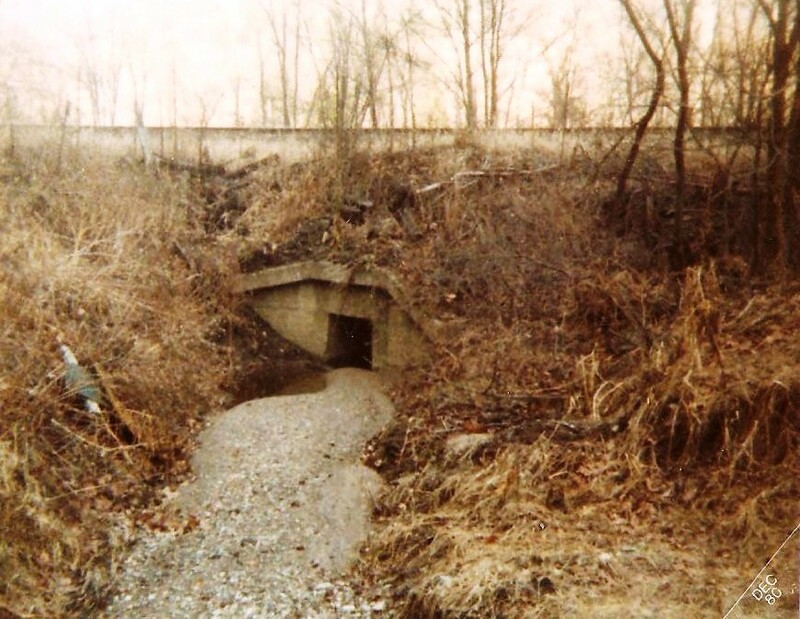 [5.12.1] We noted the placement of this culvert back in 1980 as pretty close to 3.79 miles from Derby Jct. and symbolically marking the limit of the NH&D. 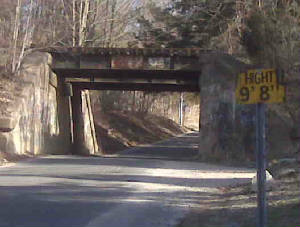 In fact, the NH&D construction crew built well beyond here to meet the HRR at the Round Hill trestle. This point is just above the line marking the Derby border across the river. 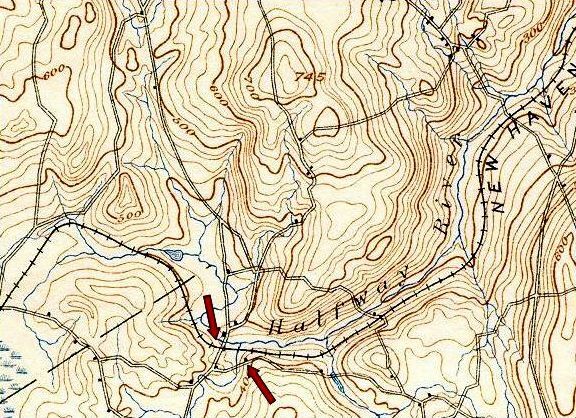 [5.13.1] This val map shows the crossing of Round Hill Brook by trestle which by 1890 was filled and no longer is indicated on the 1915 map. 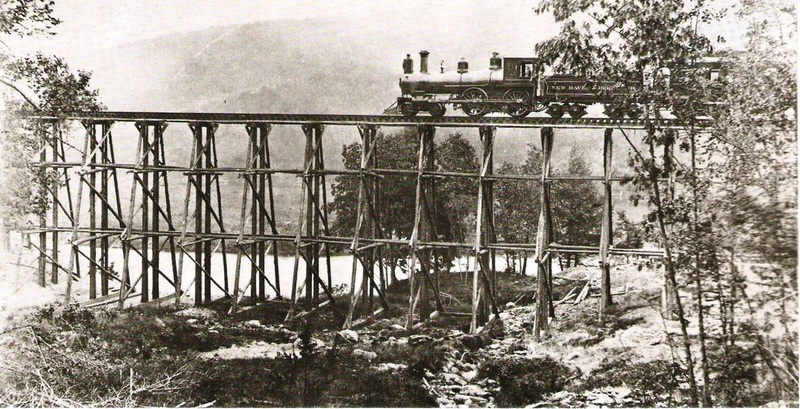 [5.14] As with most railroads of the time, these spindly wooden trestles were subsequently covered with carloads of earthen and rock fill until the tracks were on solid ground. 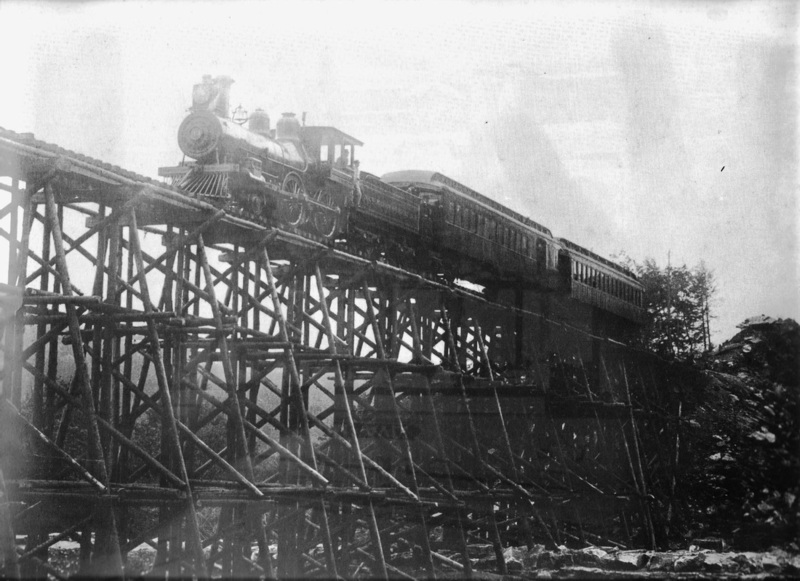 Our reporter tells us that the Round Hill trestle was 380 feet long and 43 feet high and the intention was to fill it in the coming winter (1889) with the 70,000 cubic feet of gravel that it would require. 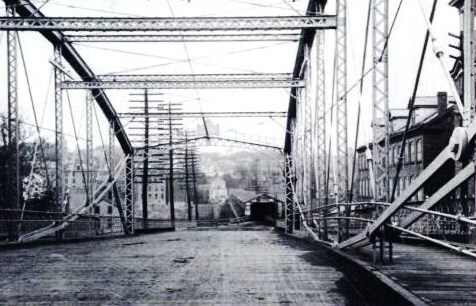 This side view of the trestle looks east with the Housatonic River in the background. 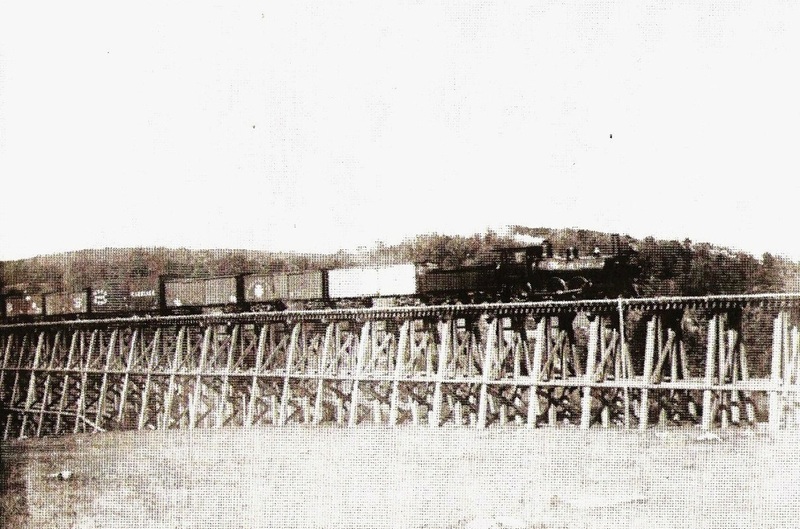 The HRR annual report for 1890 says "that the long high wooden trestle at Round Hill has been filled in during the past year..." which would likely put it sometime after September, 1889. 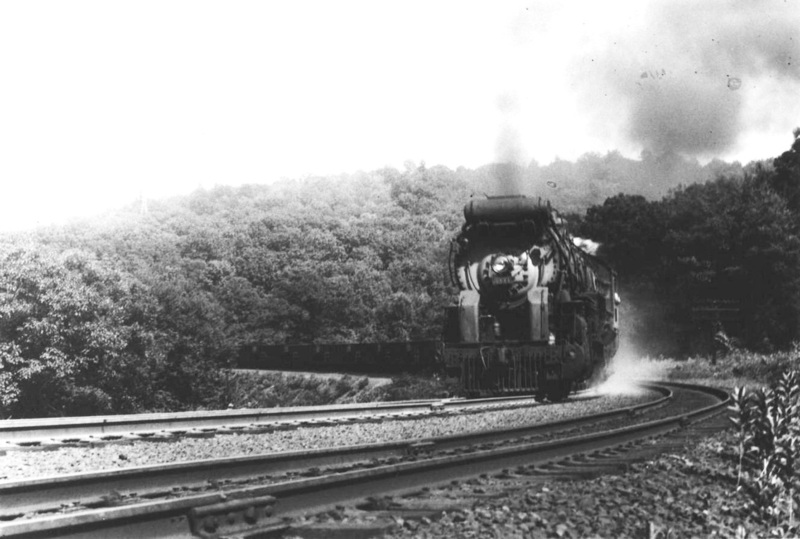 [5.15.1] This shot of the Federal Express is from the February, 1925 issue of the NHRR publication Along the Line. 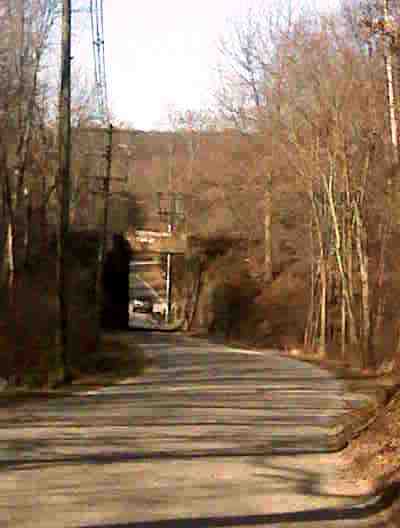 The location is identified as 'Shirt Tail Bend' at Stevenson, Connecticut. 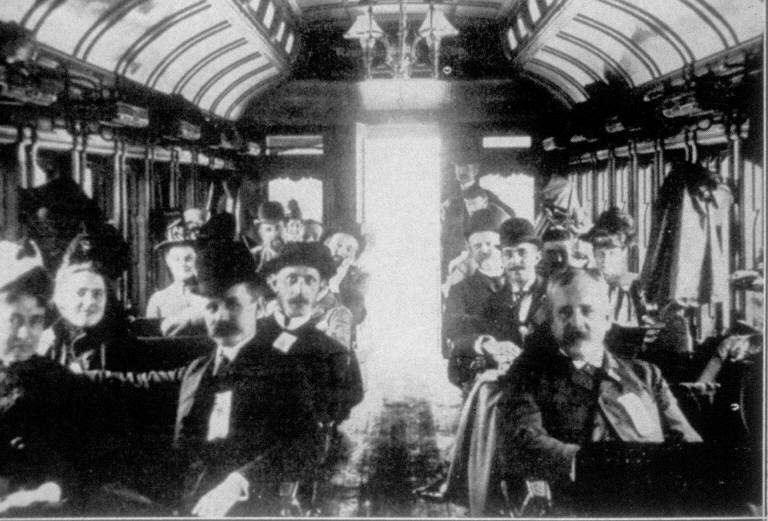 This fabled train had several routings between Boston and Washington, D.C. from its inception as the NY&NE's Washington Night Express to take crowds to the 1876 Centennial celebration in Philadelphia. The use of the steamer Maryland to transfer this train around Manhattan was suddenly discontinued as of October 19, 1912, due largely to stiffer federal safety laws governing such transport just after the sinking of the Titanic on on April 15, 1912. On Monday, October 21, the Federal began leaving the Shore Line at Devon to use the Poughkeepsie Bridge to cross the Hudson River. 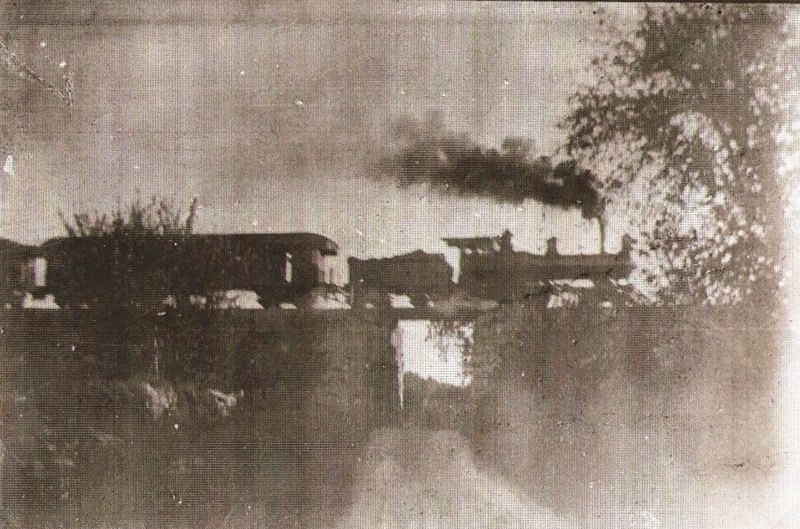 This shot appears to be the eastbound consist sometime between that date and January 9, 1916, when the train was completely withdrawn due to the unpopularity of this route "around by way of Danbury and the wilds of unexplored New Jersey and Pennsylvania" [HC/01/07/1916/08]. The train was restored on April 1, 1917 via New York City with the opening of the Hell Gate Bridge. 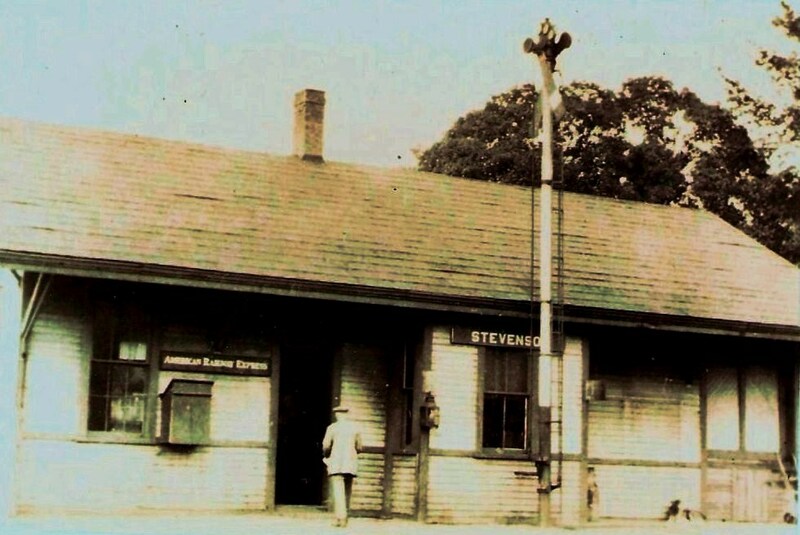 [5.15.2] We are grateful to Lee Beaujon for permission to use this great photo he took at Stevenson in the mid-1940s. It shows a New Haven 3200 2-10-2 on a westbound freight roaring around 'Shirt Tail Bend' with what appears to be a load of empty hoppers headed back to Maybrook and the coalfields of Pennsylvania. If the eastbound Federal in the shot above was running at the same time, the meet would have been in this exact spot. The Arranged Freight Train Service books that Richard Fleischer kindly consulted for us show six symbol freights running in 1922 and eleven in 1954, plus extras. There was presumably much more traffic passing here in the mid-1940s with the war in progress. [5.17.1] Thanks to the research and collections of the late Charlie Grabert, we have this priceless photo of No. 33 at what looks to be the Stevenson station. Conductor Beers is on the ground and, based on other period photos, the engineer looks like Tom Quinn and the fireman Harry Merwin. See Track 4A,, MP 4.18 and 4.18.1. The date has to be between late 1889 when this station opened and late 1892 when the NYNH&H then owned the property and the NH&D/HRR locomotives. Charlie, with whom we worked on his HRR project and our NH&D project, has also left behind a manuscript history of the HRR, something which may serve as the starting point of a long overdue, complete history of this Connecticut railroad, one of the earliest in the state. [5.18] The dynamic William H. Stevenson, vice president and general manager of the HRR and president of the NH&D, was the moving force behind the Extension. Locals grateful for the railroad he built thought that his name was the most appropriate for the station here. 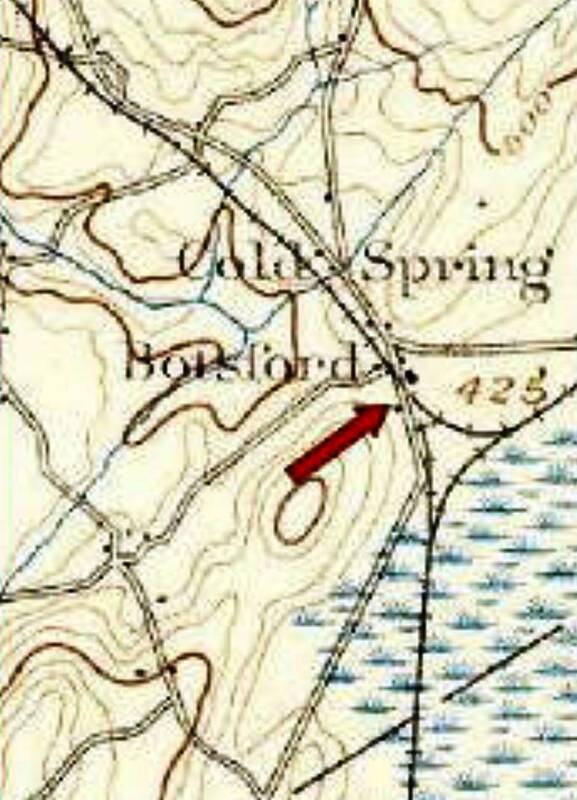 A nearby Stephens farm, used to denote the area, made the naming doubly appropriate. The golden-spike ceremony, as our reporter calls it, [See Track 6, MP 6.5.2] appears to have been just south of here at survey station 290, which was 29,000 feet or 5.5 miles from Botsford. [5.19.1] This is the second Stevenson station. 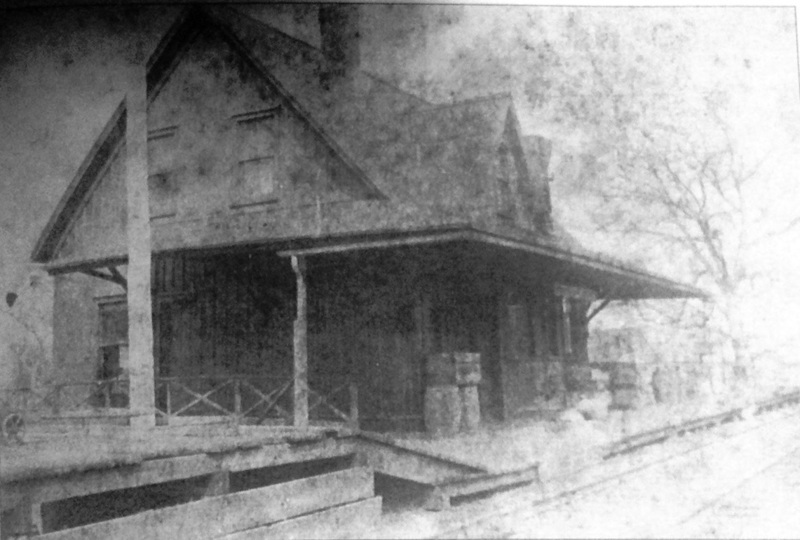 It was built as the second Monroe station on Hammertown Rd and moved here in 1905 after the first Stevenson station burned. This picture may have been taken just after this depot was put in place; note the short train order device on the roof which is supplanted by the semaphore pole seen in the next photo. [5.20] A close-up view of the second Stevenson station. Note the American Railway Express sign to the left of the entrance. 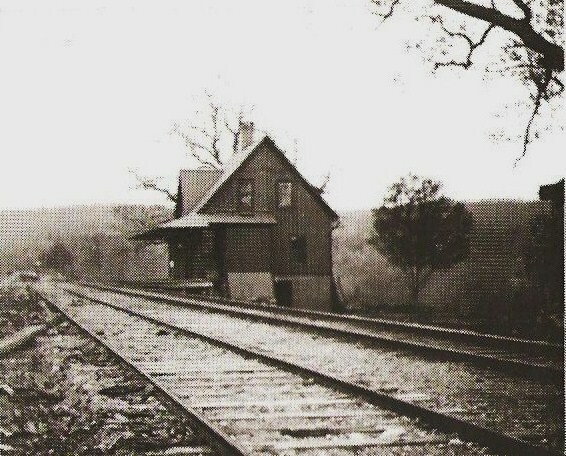 This station was reportedly to be razed by the NYNH&H in 1938 but it is still on the SSRR list of that year with no further disposition date indicated. Rail passenger service ended on the Extension in 1925. Courtesy of John Babina, Jr.
[5.20.1] This photo indicates that it was from the files of Charles B. Gunn, who is best known as the NYNH&HRR company photographer during the years of the Patrick B. McGinnis presidency of 1954 to 1956. 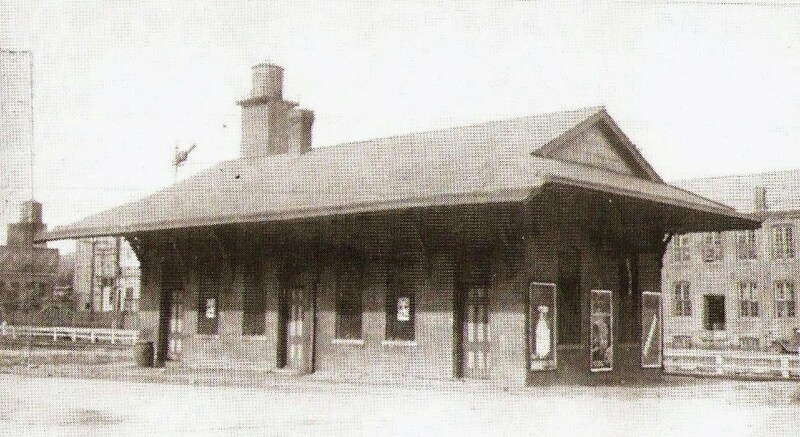 If the station was razed in 1938 as indicated above, this could not have been taken by Gunn but rather it merely one in his collection, most of which is in Archives & Special Collections at UConn. [5.22] This is a view of the Bostwick trestle at Stevenson looking eastward. The train is heading toward Derby Jct. and about to pass by the Stevenson station. 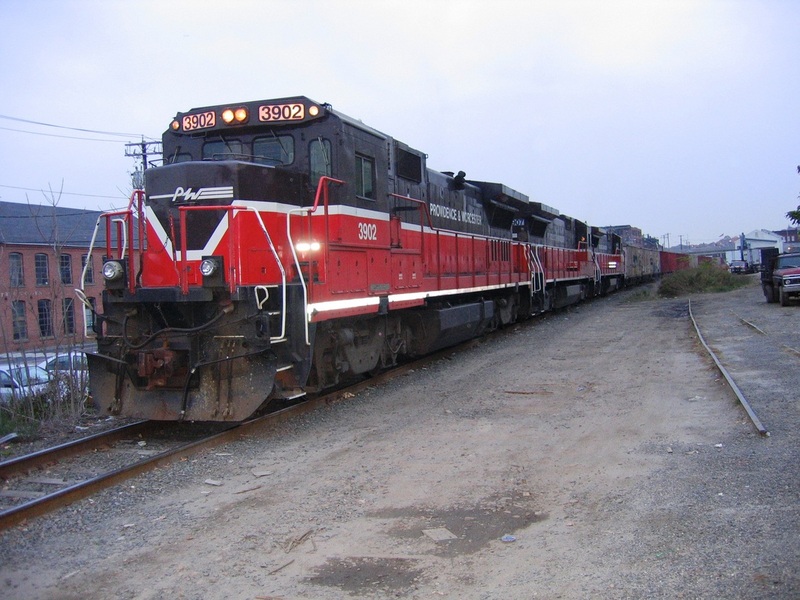 Evidence, coincidental or not, of the New York and New England RR and its connection to the Extension is seen in the famous Maltese cross insignia on the second boxcar behind the engine. 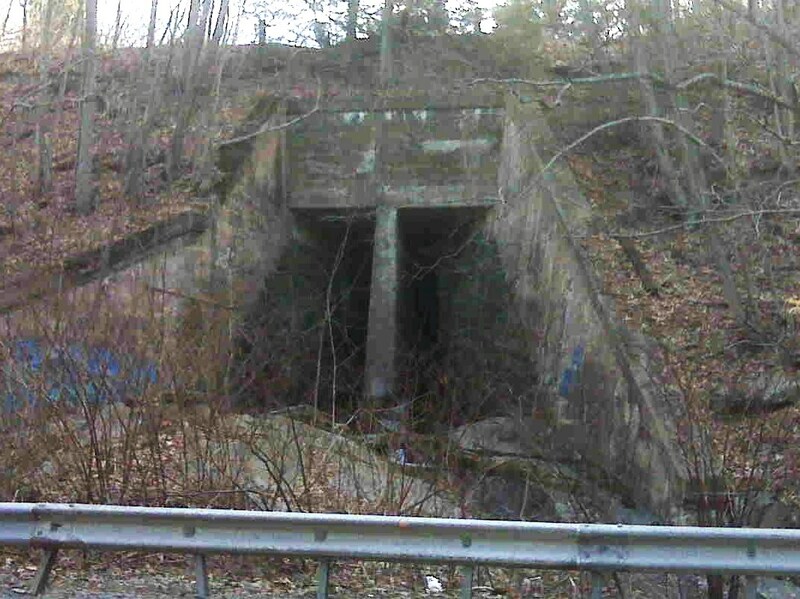 An article in the Newtown Bee relayed from the New Haven Register reported that a contract for the building of a culvert at the Stevenson viaduct had been awarded to Foley & Coughlan of Roxbury, Mass. [NBE/04/25/1902/01]. This was to allow a tributary of the Halfway River below to flow through the embankment once the trestle was filled. The trestle dimensions were given as 1,000 feet long and 70 feet deep and would require 75,000 cubic yards of fill to be dumped from cars above. The article goes on to say that this "viaduct has always been one of the points of interest on the Botsford extension, so-called." 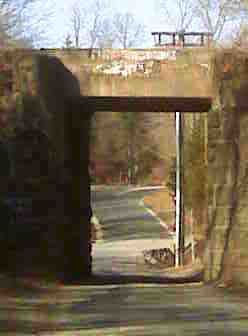 [5.22.1] This is an eastward-looking view on 3/21/2009 of the bridge over Monroe Tpke, Rte. 111, just before it ends at Rte. 34 seen in the distance. Note that the railroad overpass bridge is single-tracked by now with newer concrete abutments. This downsizing and refurbishment was probably done when the highway was upgraded. [5.22.2] The next crossing is on Bagburn Hill Rd. Two decks still remain from the era of the double track. Note the sign on the right by a graduate of the Noah Webster school of spelling! [5.23.1] Two northward views of the High Rock Rd. 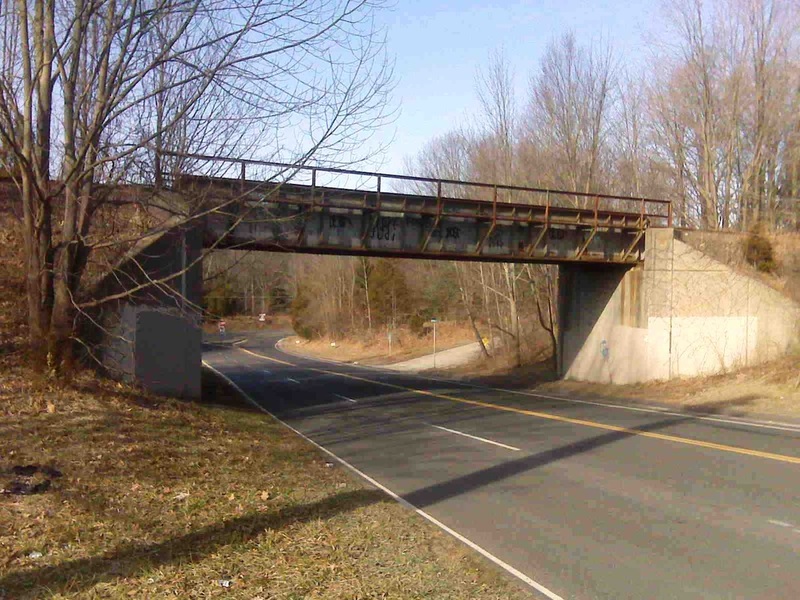 overpass in Monroe, location that is virtually on the Newtown line. These shots were taken in March of 2009. 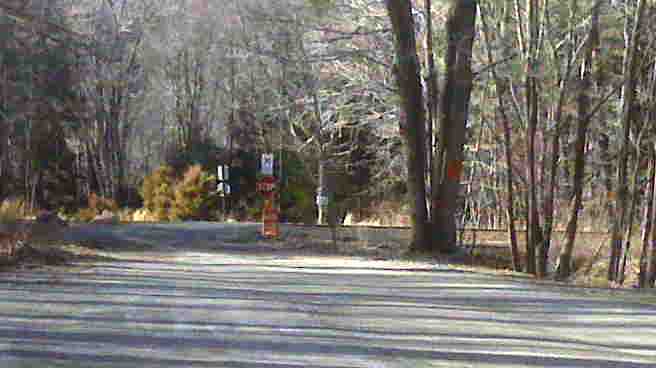 The Monroe station site, which is on Hammertown Rd., is a short distance down the track to the photographer's right. [5.23.2] This snippet is from the southeastern portion of the 1892 Danbury quadrangle. Click here. 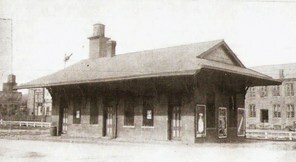 The Botsford station was the end of the line for the Extension and for the New Haven and Derby Division of the HRR. 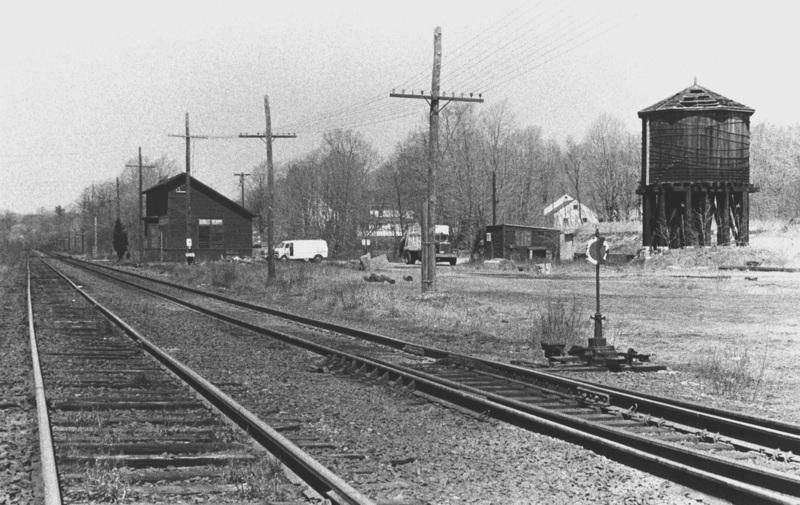 Once this trackage was in place, however, Botsford became a busy junction point for the HRR system. Considerable amounts of freight moved in and out of New Haven to points west over the NY&NE via Hawleyville, or from there down the HRR's leased Danbury and Norwalk RR to Wilson Point and thence to New York by water. 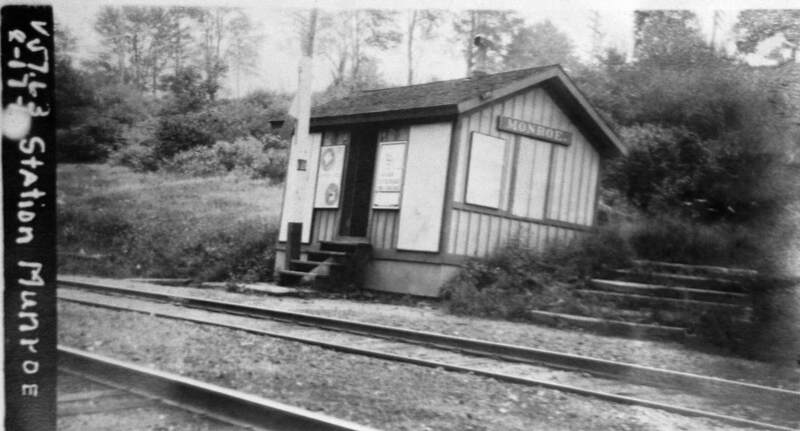 [5.24] Botsford station. In 1888, on the opening of the Extension, you could change here to go south to Bridgeport, or north for connections at Hawleyville, further north to the Berkshires, Pittsfield, or Albany and points west. Danbury also was accessible from Brookfield Jct. 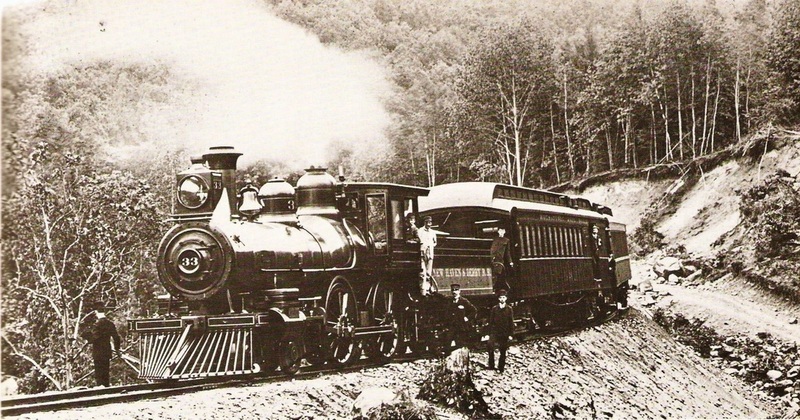 via the HRR's branch to the Hat City, the old New York, Housatonic and Northern RR. [5.25] This is the view that southbound HRR trains would see coming into Botsford. Out of sight up ahead is the wye, with the leg to the right going south to Bridgeport and the one to the left taking you down the Extension to Derby Jct., Tyler City, and ultimately New Haven. Those familiar with this location will note that the grade crossing the farmer has just used is has been replaced by the overgrade railroad bridge that is still in use today. 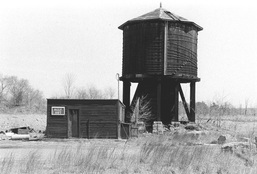 The windmill is supplying water for the massive tank that is behind the freight house and just below the line of sight. The Newtown Bee reported in 1904 that the windmill had just been installed [NBE/08/05/1904/01]. It would be replaced later by a pump. 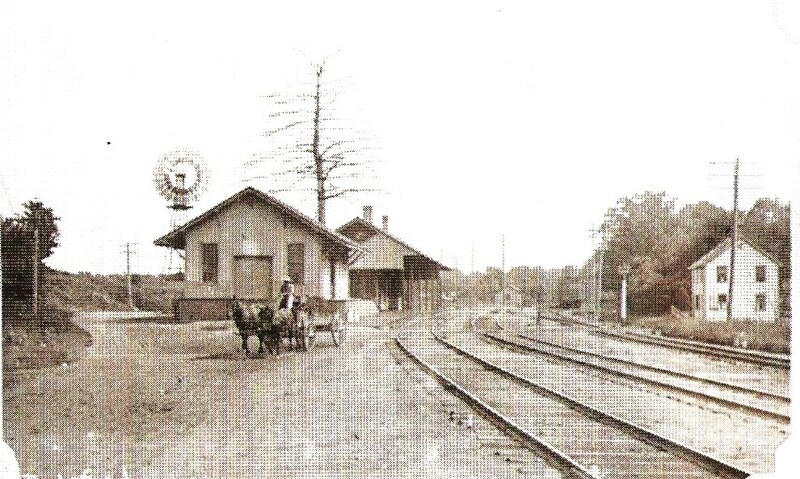 Since the grade crossing would be eliminated in 1910 with the double-tracking of the Maybrook Line, the 1907 date claimed for this photo is quite plausible. Click here for more on Botsford and see also Shoreliner 11.1.25 (1980). [5.25.2] These were views of Botsford on April 15, 1973. 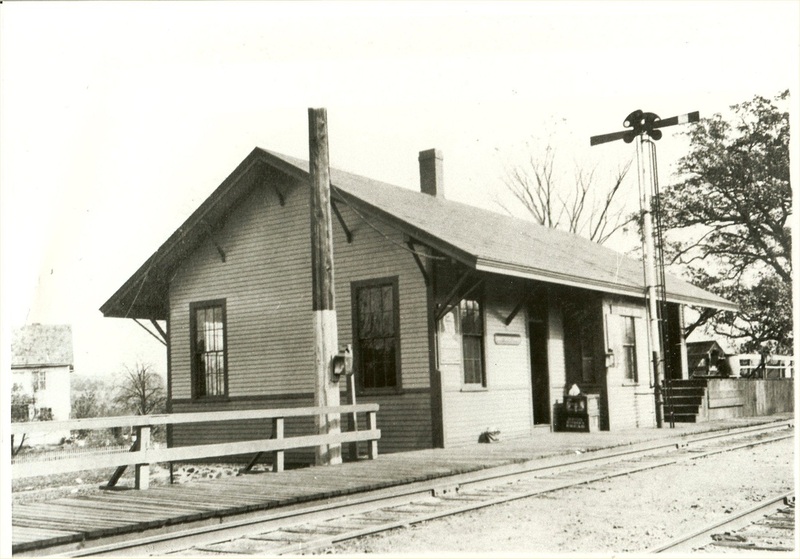 The passenger station was still standing then and in use as a woodworking shop. 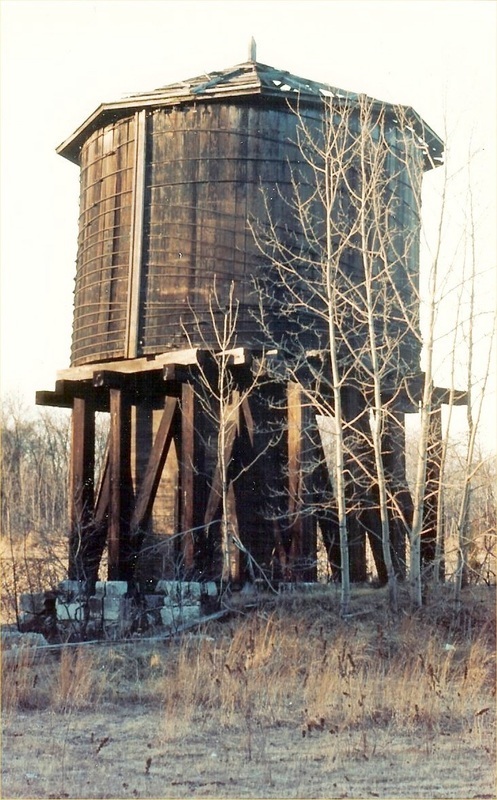 The venerable old water tower was also still in place with the pump house serving as the mechanism for feeding the tank after it replaced the windmill. All this of course was moot after steam disappeared as a source of motive power by 1950. With the exception of the vehicles behind the station, the scene is one of utter abandonment, captured here in black and white like shots of deserted western ghost towns. One might expect to see a tumbleweed rolling along. [5.26] The Botsford water tower stood here until being dismantled some time later in 1981 after this picture was taken. It is reportedly in the care of the Danbury Railway Museum and will be resurrected there. That has not been done as of January 2018.